In partnership with the We Are New York Program at the Mayor’s Office of Immigrant Affairs, HeartShare is offering a conversational English course to Arabic-speaking women, who are both parents of HeartShare pre-school students, as well as from the local Bensonhurst community. (Brooklyn, NY)–HeartShare First Step Early Childhood Center has teamed up with the We Are New York Program at the NYC Mayor’s Office of Immigrant Affairs to offer a conversational English course for parents and members of the community. Many of the Arabic-speaking women attending are parents of children at the HeartShare pre-school, but also others from the local community. “This class in conversational English will prepare those women to have a deeper understanding of their child’s academic progress,” explained Kathy Toal, Director of the Taranto Campus Early Childhood Center. The course runs Thursday mornings from 11:30 to 1:30 p.m.
“I’ve been in the U.S. for 7 years now and I took an ESL course in college, but this class has helped me feel more confident when I speak,” said Reem, a young mother to four year old Hamza. 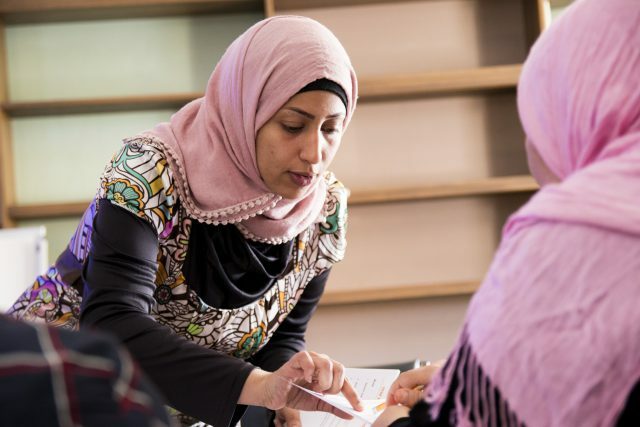 “It’s so much easier to discuss my son’s health, activities and other things with his teacher.” The women come from a number of Arabic-speaking countries, including Yemen and Morocco. 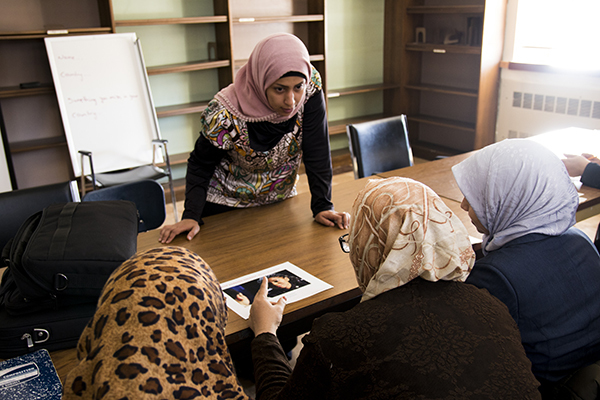 During each class, Sammraa asks the women to introduce themselves and then dives into everyday conversation topics. The participants practice by translating on the spot, as well as watching instructional videos. We Are New York includes a 10 episode series produced by the Mayor’s Office, which offers crucial information on City services for immigrants learning English. The series, adapted for native Spanish, Chinese, Russian, Arabic and Bengali speakers, also includes English vocabulary and study guide supplements. (left to right) Reem Toom, instructor Sammraa Mashrah and Imane Lakhdar. “It’s so much easier to discuss my son’s health, activities and other things with his teacher,” said Reem, a young mother of 4 year old Hamza, who attends the HeartShare pre-school. 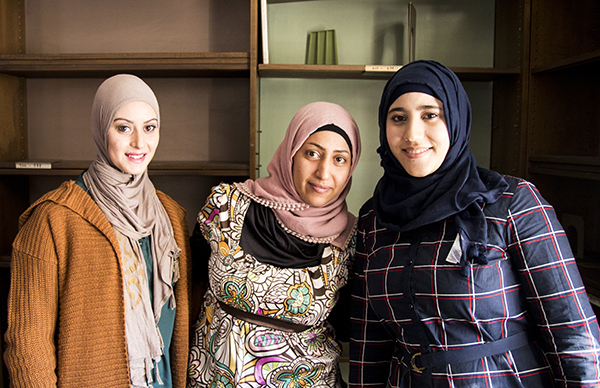 The women come from a number of Arabic-speaking countries, including Yemen and Morocco. The HeartShare First Step also has recently launched a parent group, which has created a friendlier and more open environment for parents who speak English as their second language. The group gets together to chat while enjoying an activity, like baking or crafts. “If we have at least one new parent attend, they are our ambassadors and bring their friends to the group later on. We’re building an authentic and inclusive parent community,” Conte added. HeartShare has four pre-schools for special needs and typically developing children, including Universal Pre-K classrooms, in Brooklyn and Queens. The HeartShare School, co-located in the same building as the Taranto Campus pre-school in Bensonhurst, is for children ages 5-21 with autism. To learn more about HeartShare’s services, visit www.heartshare.org.